We've been doing casino camping for years. 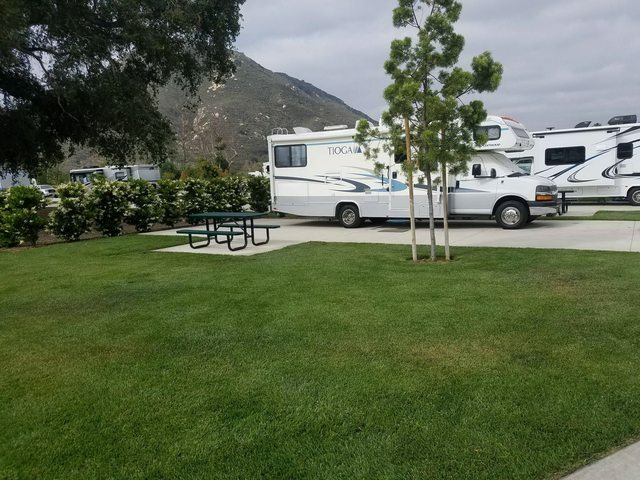 Some have RV campgrounds, some allow overnight parking. We've done both. Yep. Same here. IME, every casino's overnight RV policy differs. Some overnights are free (usually no services) some not. We prefer it to Wal Mart, when available. The rural Indian Casino's are usually the most liberal. Not so with big city casinos, especially in Las Vegas. Google Maps is your friend. Just check out the parking lots for RV's in advance. You can usually get a variety of good meals at casinos for very reasonable prices especially if you get their "frequent flyer" cards which are usually free and just take a second to get. We stayed one night at Treribles Lakeside Casino RV Park in Osceola, Iowa on I35 south of Des Moines, about 50mi. It is a nice park. We use casino lots when they are in the right place. Because we were running on Street Atlas early on, and I had found the overlays, one of which was for overnight parking, we have used casinos from time to time. We never managed to get there when there was even an electric place open. That is not essential when we are in Travel Mode. One we use kind of regularly if we are westbound, is the Casino Queen in East St. Louis. There is both an FHU campground in walking distance to the light rail that can take you into town, or an empty area at the east end the we use when the FHU is closed. They provide a shuttle to the main from both. The only bad time we has was when we had situated ourselves for the night an a semi parked nest to us and he was both idling and running a loud reefer. I moved over to a car park section (out coach is only a little smaller than a big dually or a stretch passenger van, but the security guy came and bothered me. I explained the situation and it was clear that he did not care. So I left in a manner that made my displeasure very apparent to all that might observe. There was no RVParky yet, if there had been I would have written a carefully worded review. We never again ONPed at a casino that relegated us to the trucks only lot. Have stayed in a couple, as others have said-when convenient. One in St. Louis, Mo was on the rail line. Stayed several days, could eat at the Casino and travel easily to the city. Could walk to both the casino and the rail station. We've run out in the house, but the RV has two. We have stayed at Council Bluff (Harrah's) and Harrah's Cherokee. It has been several years for each, but I believe Council Bluffs had electric and was 20 bucks. Cherokee was free. Cherokee has expanded a few times and I don't know if it is still free. Yes, we use 7 Feathers and Rolling Hills. Both on I-5. I have checked out others with plans to stay, but ended up on different routes. We did a trip a few years ago in to North California and used the site to get some info. Had lots of fun. We generally dry camp, as for an overnight stop why pay? Only one place that we have been to was security rude. We got a late start in the AM due to DW having a work issue. Was a whole bunch of people in the restaurant that heard my displeasure with the wanna-be cop. Needless to say I left a poor review. Been to several that really didn't have good parking but they bent over backward to help and make our stay comfortable. I've done it a couple of times at the casinos near me. Some of them are quite nice. Others are just a parking lot. The closest one to me used to be nice but, have upped their prices to the point of being not worth it to me. This is one of the Casinos that I stayed at,Pala Casino is all that. The review and pictures that I submitted to the Casino Camper website shows the sites and how big they are with the large grass areas between each site. Once the trees and hedges get grown each site will be very private,they were almost there last time. I was there just prior to the opening then came back later and enjoyed my stay and have been back and have another trip planed soon.